Pictured here is a tiny 'miniature' lantern clock by John Drew of London dating from the late 1680s. A miniature is a small clock, but this one is exceptionally small, as miniature is a term often given to clocks which stand nine or ten inches high, and this stands less than seven. The Edward Speakman clock in plate 1 is a miniature at 8 1/2 inches, but the John Drew (far left) can be seen to be much smaller, standing just 6 3/4 inches. Lantern clock sizes are a little tricky to discuss. There is quite a variation in size, but the great majority, of 'standard' or regular size, stand about 15 to 16 inches in overall height. Accuracy in recording height is difficult because the upper finial above the bellstrap may often be a replacement, or may have been shortened slightly through damage. A replacement bell strap could be another reason why measured heights are unreliable. The upper finial, of course, may not always have been a full height one, as we often assume, that is may not necessarily have been a match to the corner finials. There is some evidence that some of these clocks were intended to be cased, and that in those instances the top finial may have been a considerably shorter one than the corner finials. I think it was Jeremy Evans ('Thomas Tompion at the Dial and Three Crowns' published by the Antiquarian Horological Society in 2006), who was the first to point out that Thomas Tompion's lantern clocks varied considerably in the finish of, amongst other things, their finials in that some had the full top finial, others had a cut-down version, others a simple nut, others a bellstand rather than a finial. In other words they were made that way originally. He suggests the reason for that is that some were to be cased, when a top finial would impede the design of the hood. For years restorers have assumed, in some cases wrongly, that a non-matching top finial was some kind of mistake by a past restorer, and have replaced them with newly-made matching ones, quite possibly incorrectly. All of which implies that the best policy is to leave well alone. This unreliability of measurement of the overall height is one reason that a more accurate method is to measure lantern clocks by the size of their parts - the pillar height (including finial and foot), the plate width and depth, the chapter ring diameter and the chapter ring width. I think George White was the first to publish sizes in this way in his book 'English Lantern Clocks', but it is becoming regular practice. Even so it is still much easier to envisage a clock's size by knowing its total height, and if need be by allowing a little plus or minus. A pillar height is not very informative unless you know what a standard-sized one might measure - usually between 10 and 10 1/2 inches in fact. I have never been impressed by attempts at expressing these measurements in centimetres, as the men who made them used inches. Yet many measurements fall slightly short of a true figure in inches. This is because the worked size after turning, filing, polishing may well be slightly smaller than that before. The standard clock stands 15 to 16 inches in overall height. Others are known standing 12 to 13 inches, sometimes called a 'three-quarter-size clock'. Those often termed 'miniatures' are usually around 9 to 10 inches, and really tiny ones stand around 7 inches, but these latter are very rare. Giant ones at 17 or 18 inches are known but are also very rare. The photograph in plate 1 shows four such clocks standing side by side, when the differences are more apparent. The Edward Speakman clock is one of the type discussed above whereby the bell is held by a conventional bellstand (like that in a longcase clock) and the top finial simply screws onto the bellstand end and is different from the corner finials. This may well be the original arrangement. The smallest clock illustrated in the group is that by John Drew. 1. This group of four clocks shows some of the sizes: Left to right are clocks by John Drew of London, Edward Speakman of London, John Lyon of Warrington and Solomon Wasson of Bristol. The John Drew is exceptionally small, even for a miniature. Click for closer view. 2. The exceptionally small size of this miniature lantern clock by John Drew of London can be seen realised when pictured alongside a normal sized clock by John Ebsworth of London - 6 3/4 inches alongside 15 1/2 inches. John Drew was apprenticed in London through the Clockmakers' Company in September 1676 to Joseph Knibb and was freed from his apprenticeship in September 1684. He took eight apprentices himself over the years, but I am not aware of any lantern clocks by any of them. I know of several longcase clocks by him and two other lantern clock besides the one featured here. One of those is also a miniature with ting-tang striking. His clocks are sometimes signed, as this one, 'John Drew Londini fecit' but at least one is signed 'John Drew Johnson Court in Fleet Street'. In April 1712 he was appointed to the position of Beadle in the Clockmakers' Company. The Beadle was a sort of overseer, whose duty was to keep order during meetings, but in fact it seems to have been a bit of a sinecure as the Company almost always gave the paid position to members who were poor or in ill health or both. Some holders of this office were invalids and so the job cannot have been to keep order in the way that a bouncer might be required to separate sparring members during drunken brawls. More likely he kept the paperwork in order. John Drew took the post over on the death of Richard George, who is thought to have been an engraver and held the post for some dozen years or so, during which time he was also given occasional charitable payments by the Company. It was not unusual for engravers to suffer from bad eyesight from years of close-up work. John Drew himself received charitable payments from the Clockmakers' Company from January 1713 till he died in the autumn of that year, just two years after his late master. The implication is that he was in poor health in the last year or two of his relatively short life, for he can have been barely over fifty one when he died. After his death the Company paid a 'pension' in the form of charity to his widow till she herself died two years later. The Beadle who succeeded John Drew was Christopher Gould, a famous maker today, but by no means the only famous one to have ended his days in poverty. It is a sad reflection on the trade that clockmakers of such ability died in poverty, and almost always it was a result of their inability to work through ill health. On one occasion in January 1677 the 'Widow East', the widow of one of the many clockmakers called East, was granted a charitable payment of ten shillings, but when the Master called to deliver it he found that she had died - 'but the daughter being in great need, he gave her five shillings, and put the rest in the poor box'. This in itself is enlightening as it implies that charitable payments were not from Company funds, or the Master could have put the residue back in the kitty. The implication is that these funds were raised by having a whip round amongst members, which is why the Master could not give it back to the donors as he would not know who had given what. This miniature clock is very unusual in being a true lantern clock, in that it strikes the hours. Strictly-speaking the term 'clock' should be used for one which strikes the hours. Many lantern clocks are in fact what should be more correctly called alarm timepieces, that is they do not strike but have the bell just for the alarm. 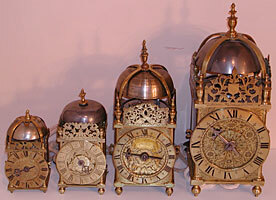 This is especially the case with miniatures, which are almost always non-striking clocks with alarmwork. The maker has here tested his skills to the extreme to get both a going and a striking train into such a small space. Those miniatures which are strikers tend not to have alarmwork as well. 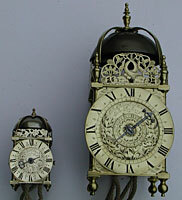 One or two such striking miniature clocks are known of this extreme small size. 3. This clock was made in the late 1680s by John Drew of London, a former apprentice of Joseph Knibb. The style is very similar to one used by Knibb for his smallest clocks, including the very shallow fret. Click for closer view. 4. 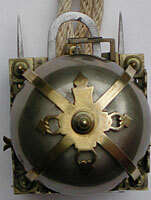 The bellstrap is pierced on only three of the four arms, the unpierced one probably intended to sit at the back. Three or four 'miniature' lantern clocks are known by Joseph Knibb and his brother, John, of the 9 to 10 inch size, and these tend to be timepiece alarms. Two or three are also known of the extremely small miniature type, which are strikers without alarm - George White pictures one as does Ronald Lee*. In this example John Drew was clearly making a type of clock he had seen during his training under Joseph Knibb. George White points out that the Knibbs used continuous pillars in their smaller lantern clocks, that is those less than about ten inches high. John Drew does the same. Regarding the clock itself, the dimensions are: total height 6 3/4 inches, pillars (including feet and finials) 4 1/4 inches, chapter ring 3 1/4 inches. The finials and feet are very abbreviated. The top finial on the bellstrap is also short in height, but not quite the same as the corner finials. Joseph Knibb used tiny finials and feet, similar to those used by John Drew on this clock, though not quite the same. These very low finials mean that the bell needs to sit less high than on a normal clock, resulting in the frets being much shallower than usual. The result is that John Drew, like Joseph Knibb, used a very shallow fret shape, which is only seen on these tiny clocks - though more than one pattern is known. The bellstrap of this clock is unusual as it has piercings in only three of the four arms (or legs?). Presumably the unpierced arm is meant to go at the back, where it would hardly show. Was John Drew being a cheapskate, cutting corners to save an extra hours work in the making of what must have been a costly item by piercing three legs and not the fourth? Could he have got away with this, or would his client on taking delivery of the clock have been appalled and have sent it straight back for proper finishing? Well if you have ever taken the bellstrap off a lantern clock and put it back again, you will know that there are four possible positions it can fit in. Commonly the wrong position will result in the hammer jarring against the bell, or failing to reach it at every blow. You usually have to try three or four positions to find the optimum one, where the strike rings clearly. The stiffness of the 'spider' tension often makes removal and re-fitting a finger-trapping irritation which we all hate. John Drew has purposely marked his bellstrap to indicate which leg faces the back. So in fact he was not cutting corners but thinking ahead. I have not especially noticed this feature in the clocks of other makers, though I don't imagine it is unique to John Drew. Behind the dial are scratched the dates of some repairs or perhaps occasions of cleaning. Ones I spotted include 1788 Aug 17, 1784 and 1801. One old repair is a replaced tooth on the hour wheel (plate 10), perhaps performed on one of those dates. All in all this is an interesting little clock and it demonstrates that the pupil learned well and could do just as good a job as his master. This little clock was a luxury item made for an affluent client during John Drew's earlier years. I cannot help but wonder how he would have looked back at such work in his later years of poverty. George White 'English Lantern Clocks' 1989. R. A. Lee 'The Knibb Family Clockmakers' 1964. This article was first published in Clocks magazine with more illustrations.